The major adult (and human) character was Charlie Chan, the detective of Chinese descent who had first appeared in a lengthy series of novels launched by author Earl Derr Biggers in 1925. Audiences were familiar with him mostly through the movies, dozens of which came out between 1926 and '49, in which Charlie, a detective with the Honolulu police, solved crimes with the assistance/comedy relief of one of his sons (generally referred to by birth order, i.e., "Number One Son" or "Number Two Son"). Here, he wasn't limited to just one son at a time — he had no less than ten sons and daughters (Henry Chan, Alan Chan, Stanley Chan, Suzie Chan, Mimi Chan, Tom Chan, Anne Chan, Flip Chan, Nancy Chan and Scooter Chan), and they were all every-episode regulars. This incarnation of Charlie Chan gets high marks from promoters of racially correct casting, in that it was the only time Charlie was played by a Chinese actor. The movies had featured Warner Oland, Sidney Toler and other occidentals in the role, wearing make-up that was often not entirely convincing. But in this show, his voice was done by Keye Luke, best known as Master Po in the contemporary TV show Kung Fu, but also known for having played Number One Son back in his younger days. Luke's other cartoon roles included various voices in Thundarr the Barbarian, Jem & the Holograms and Jabberjaw. More than ten different actors played his children, as some were replaced for the show's brief second season. Among the crowd were Lennie Weinrib (who also played Inch High, Private Eye), Robert Ito (Goose Lee in Darkwing Duck), Brian Tochi (Leonardo in Teenage Mutant Ninja Turtles), Janet Waldo (Penelope Pitstop), and Jodie Foster (better known for face than voice acting). The dog, Chu-Chu (yes, even with ten kids, there was still a dog), was Don Messick, who also played non-anthropomorphic creatures in The Jetsons, Dastardly & Muttley and The Herculoids. 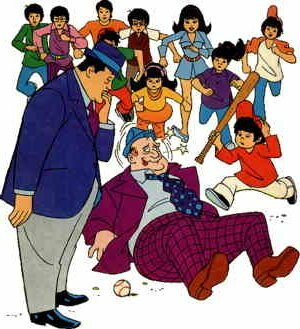 Like many Hanna-Barbera cartoons of the early '70s, The Amazing Chan & the Chan Clan borrowed a few elements from Scooby Doo, which was by far the studio's most popular show at the time — in fact, the whole idea of licensing a character that solved mysteries was likely inspired by Scooby's mystery-solving schtick. The kids did most of the mystery solving, with Charlie showing up at the end to wrap things up. They traveled around in a van that, like Hong Kong Phooey's Phooeymobile, could be transformed by the touch of a button into whatever type of conveyance was needed. Most of the shows "inspired" by Scooby Doo's success met with neither critical nor popular acclaim, and this one ran true to form. It ran two seasons, but with 12 episodes in the first and only four in the second, wasn't among Hanna-Barbera's longer-lived hits. There was a Gold Key comic book version, with art by Warren Tufts (Casey Ruggles, Pink Panther), but it lasted only four issues. There wasn't much other merchandising. Nowadays, reruns can occasionally be seen on the cable TV channel Boomerang, which specializes in old Hanna-Barbera cartoons. Text ©2004-07 Donald D. Markstein. Art © Hanna-Barbera.